Push back racks offer a blend of high-density storage (up to 6+ pallets deep) and good selectivity (single SKU per lane). Push back racks offer a wide variety of configuration options to ensure optimal use and efficiency for a broad range of applications. There are several types of push back rack. 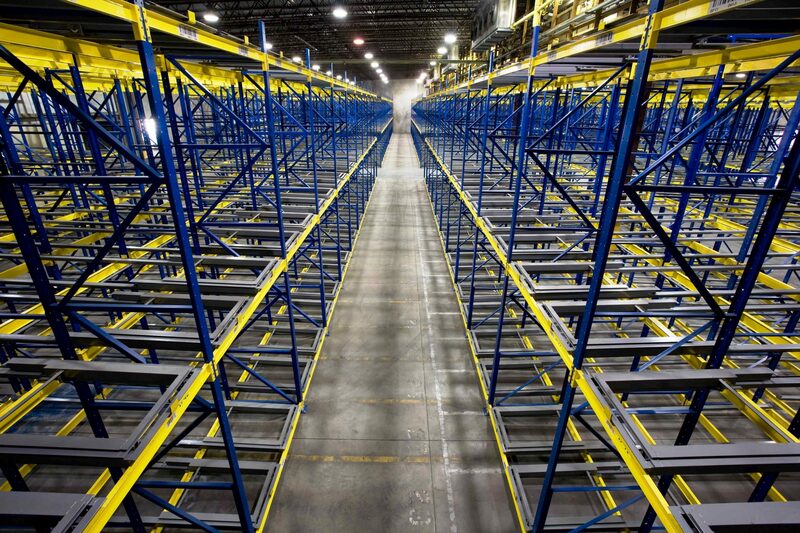 One common type of push back rack utilizes nesting carriages or carts to store each pallet. The free rolling carriage is pushed back into the system by loading additional pallets, allowing the storage of multiple pallets without driving or reaching into the rack system. The next type of push back rack utilizes common flow rails providing for the push back means and storage. Another type of push back rack utilizes chain technology to store pallets up to ten deep and doesn’t require a pitch while providing height space utilization benefits. When unloading, pallets of products are removed and gravity brings more pallets forward in each lane. Push back racks utilize the last-in/first-out inventory method, and offer more versatile storage options than drive-in racking solutions. We can help you design the right system for your facility based on your space, products, and needs. Call us at (866) 266-2244 today and one of our pallet racking specialists can visit your facility and perform a site inspection.